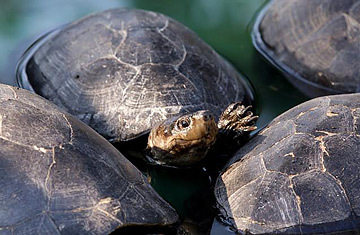 Malayan box turtles rest in a pond at Hong Kong's Kadoorie Farm and Botanic Garden. The reptiles were among a cargo of 10,000 turtles which were being shipped from Southeast Asia to markets in mainland China when they were intercepted by Hong Kong customs officials. Globalization has brought Americans tech support from India, Chinese-made Christmas lights, T-shirts from Bangladesh and those inexpensive Aussie wines, but U.S. conservationists are sounding the alarm that global trade is a two-way street that threatens American wildlife  thanks to rising economic tides in Asia and the fast and easy import-export routes between China and the U.S.
Turtles  except for the occasional slow road-crosser  are not on most Americans' radar. But the Asian appetite for turtles, whose meat and body parts are believed to hold a variety of medicinal and life-enhancing qualities, is creating a global market for U.S. turtles and tortoises. During the Great Depression, Americans living near the country's wetlands harvested high-protein turtle meat, sometimes so aggressively that it threatened local species. In the early 1930s thousands of pounds of terrapin were harvested in Maryland, but by 1937 the yield had fallen to just 537 pounds, according to Peter Paul van Dijk, director of the tortoise and freshwater turtle biodiversity program at Virginia-based Conservation International (CI). Turtle meat is still eaten in parts of rural America and there is a growing domestic market in urban Asian-American communities. The meat also has found its way onto high-dollar menus at fashionable wild game restaurants across the country. But ever since China opened up its economy in 1989, conservationists have become alarmed at that country's insatiable appetite for turtle meat. "We have seen the Chinese trade vacuum out one region after another  Burma, Vietnam, Borneo, Java, then Sumatra," says van Dijk. Typically, the trade follows a three- to five-year boom and bust cycle, van Dijk says, adding that 75% of Asia's 90 species of tortoise and freshwater turtles now are threatened. Worldwide about 40% of long-lived, slow to mature species are at immediate risk of extinction, according to CI. Now, conservationists fear the Chinese turtle trade has the U.S. in its sights. "What we are seeing is the globalization of wildlife," says Matt Wagner, head of the wildlife diversity program at the Texas Department of Parks and Wildlife (TPWD). After years of little or no regulation of turtle harvesting, the state began issuing harvest permits and monitoring numbers a decade ago. As the harvest numbers increased regulators became concerned that turtles may be the new buffalo: once ubiquitous, now rarely seen thanks to aggressive harvesting in the 19th century. Later this month, TPWD will hold hearings on proposed rules to either limit or ban commercial turtle harvesting. "Bayou Bob" Popplewell, the owner the Brazos River Rattlesnake Ranch south of Dallas, is the founder U.S. Turtle and Aquatic Resource Technologies (USTART), a cooperative with some 400 members who collect and sell turtles primarily to the Asian market. "This is a vast renewable resource that we can harvest and manage wisely," Popplewell says. "These are among the very most adaptive of all wildlife  look around us, city parks, bar ditches, drainages, every pond and private lake, large impoundments, creeks, streams, rivers, even literally temporary potholes  yet they are all actively supporting some level of turtle population," Popplewell says. "State public waters are huge and so are private waters... and the turtles got there by default  especially in private waters... the turtles arrive and thrive, everywhere." One of his USTART's co-op members, a rancher who harvests turtles in a 200 acre lake on his land, makes about $2000 in two weeks during spring and summer seasons, Popplewell says. Any effort to regulate the Texas turtle harvest must deal with the reality that 95% of the land in Texas is in private hands, Wagner says. But even in states with large areas of public land the turtle harvest debate has been contentious  Minnesota has grappled with the issue for over a decade. Other states have banned commercial harvesting of wild turtles among them Tennessee, Mississippi, North Carolina and Alabama and just last month, Maryland. But until now, Texas was one of a handful of states that remained wide open. Popplewell, who wants more hard numbers on the effect of wild turtle harvesting, says as a bottom line he could support banning harvesting in public wetlands and waterways  in fact, he urges his co-op members not to collect there and he does not collect certain species of turtle. Four land turtles in Texas are defined by the state as threatened. It is estimated that 31.8 million turtles, 97% farm-raised, were exported out of the U.S. between 2002 and 2005, according to a study by the World Chelonian Trust. The turtle traders have not focused on harvesting in Africa or Latin America, largely because transportation logistics and costs are not competitive there, van Dijk says. Dallas-Fort Worth Airport is a major regional shipping point for turtles collected in the wild and harvested on turtle farms in Oklahoma and Louisiana. The turtles are packed in containers and shipped by air to Asia. Customs officials at both ends monitor the shipments, but accurate numbers and reliable records of which species are being exported are not complete, conservationists say. "The Chinese face the same problems as the U.S. officials  they simply can't inspect every single shipment, but they are on the right track," van Dijk says. China has signed on some key international monitoring rules, but the scale of trade makes oversight difficult. There also have been efforts to establish a turtle-farming industry in China  Popplewell has exported breeding stock from Texas  and a recent study co-authored by van Dijk found about 1000 turtle farms in China. But van Dijk says the farms cannot support the rising demand in a country where incomes are also rising. Wild turtles are still valued by consumers over farm-raised stock and Chinese turtle farmers prefer wild breeding stock. Turtles may be slow movers, but when they escape farms they can pose a breeding and disease threat to already diminished local species. The challenge, TWPD's Wagner says, is to keep abreast of all the changing forces in the wildlife global marketplace. It is not just American turtles that are in the spotlight. The proposed Texas rules will look at the harvesting of other species including lizards and snakes. Wildlife management is not just about checking fishing and deer hunting licenses any more; it's gone global. What's next? "Bayou Bob" Popplewell says he is already discussing a potential Chinese market for the feral hogs that plague so many Texas ranchers.